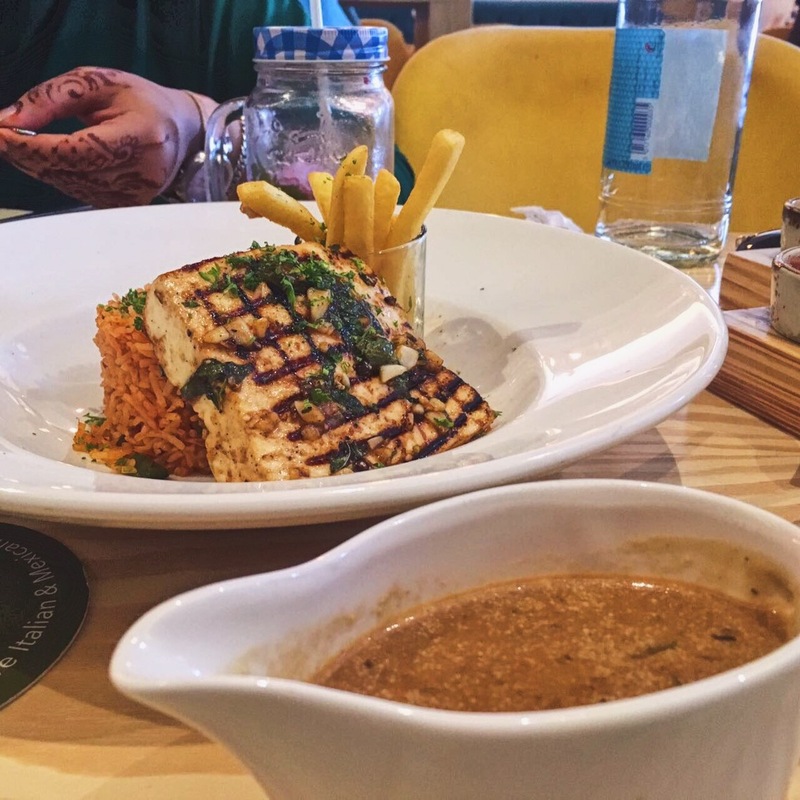 Quattro Dubai: What makes this vegetarian eatery stand out? I discovered a perfect place for lunch where good quality and ‘presentation on point’ kind of food is served at a reasonable price. Now, let me tell you more about the vegetarian eatery that offers fusion of Italian and Mexican, Quattro. Herbivores should definitely visit Quattro but the real question is, will non-vegetarians enjoy it? Quattro, which means four in Italian (incase if you were wondering) is lively and stylish while being family oriented. I definitely liked the random unique element- a huge tree in the middle of the restaurant. I mean, why not? Note: Before I begin, I will to confess that the servers asked us if we like mushrooms which I do but like a fool, I completely forgot about truffles and said yes. Unfortunately, few of the dishes had truffles and I don’t fancy truffles at all. So it was completely my fault and it’s unfair to review those dishes. 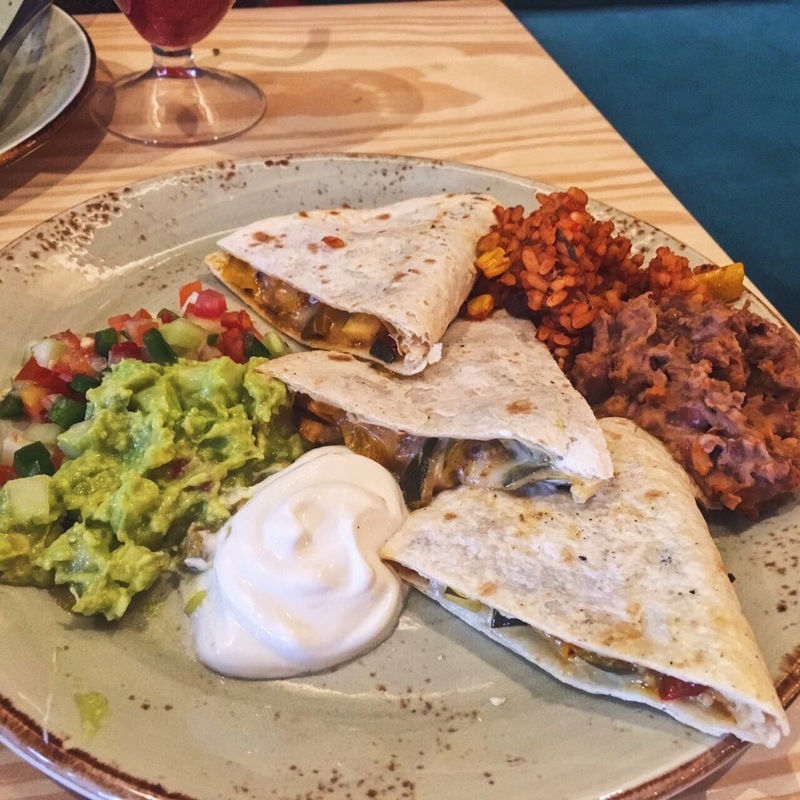 Taquitos– I would like to call this dish, a roller coaster ride! These delicious gluten-free fried cones were a treat to the eyes as well as our tastebuds- colourful with fresh beans, jalapeño, tomatoes delicacies and a scoop of avocado ice cream. I can’t forget the amazing explosion of flavours in my mouth! Filo parcel- Little flaky pastry were heavenly, filled with spied corn and olives and every bite was a satisfying crunch. Olive and mushroom Crostini- Specification of green olives served on a toasted baugtee slice with mushrooms. Cottage cheese– Succulent and lightly spiced smooth cottage cheese along with orange rice and mushroom sauce. It is as good as it sounds- rich, tasty and visually appealing! I am not a big fan of the sauce however the paneer won my heart! I am definitely going back for it! 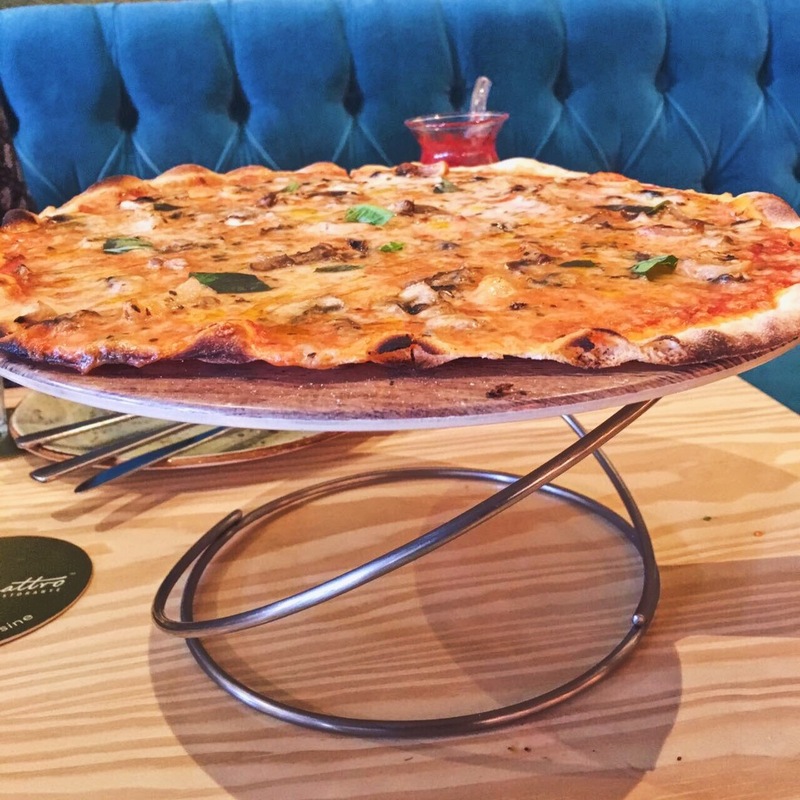 Al Funghi- tomato sauce, mozzarella, mushrooms, garlic flakes, oregano and basil with truffle oil. The moment of truth for all the non-vegetarians out there, both the cuisines are like an unexpected surprise, you can’t tell the ingredients until you taste it. If you are that kind of a person (or not), have Quattro! Overall, it was a sort of a successful discovery. To be honest, I didn’t like everything since I don’t like truffles (as I mentioned earlier) however there were few dishes which made my tummy happy. Not to forget, the lovely atmosphere, cool gastronomy and unique flavours! Thank you Quattro for having us! Previous Post Aubaine Dubai: Cream first, or jam first?